Some retailers have their own policies and restrictions. 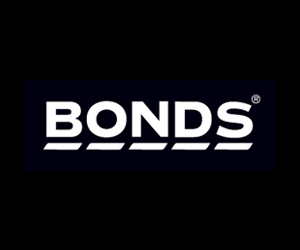 Before shopping, please ensure you review the Special Terms of Bonds (above) for further information. Complete your purchase in one session and without leaving Bonds. Do not click on any bookmarks or advertising banners or links once you leave ANZ Bonus Points Mall. We offer Free standard shipping across Australia, no matter how large or small your order. We use Australia Post eParcel to get your items to you, so you'll only have to wait 2 to 5 working days once your order has left our warehouse. For express shipping where available, we charge a flat fee of $9.95. For products purchased online and delivered within Australia, we will accept returns for change of mind within 30 days from date of receipt, or if faulty. Goods can be returned using a Reply Paid address at no cost to you. For change of mind returns, items must be unworn with tags still attached. For products purchased online and delivered outside of Australia, we will accept returns for faulty items only.